Luxury boutiques and car dealerships have found ways to make money even as the exchange rate makes imported goods more expensive. The dramatic decline in the value of the ruble at the end of 2014 caused a subsequent rise in the prices of imported goods in Russia. As the ruble fluctuated wildly in mid-December, retailers changed their prices several times a day or stopped selling certain items altogether. Other stores decided to use the exchange rate as a marketing tool, advertising that their prices remain the same despite the higher exchange rate. The ruble’s dramatic drop reached its climax on Dec. 16, when the value of the euro and the dollar grew by nearly a third against the ruble. According to the Moscow Stock Exchange, the ruble plummeted by 41 percent against the dollar and 34 percent against the euro in 2014. One of the first stores to advertise a fixed exchange rate was luxury clothing retailer Bosco di Ciliegi, which has designed several of Russia’s recent Olympic uniforms. International brands including Alberta Feretti, Kenzo, Max Mara, La Perla, Jean Paul Gaultier and Barbara Bui have also maintaining a fixed exchange rate so far. According to Darya Yadernaya, managing director of the fashion consultancy Esper Group, Chanel, Longines, and Richemont have not reassessed the prices of their items to align with the new exchange rate because of the cyclical nature of retail goods. “Most supplies come in July and August, so in those stores you can find goods whose prices were calculated on the basis of the summer exchange rate to the dollar,” Yadernaya said. Foreigners in particular stand to gain from buying items in Russia at the old exchange rate. According to Esper Group’s calculations, while tourists used to account for around 4 percent of all consumer purchases in Russia, in November-December that figure tripled to 12 percent. 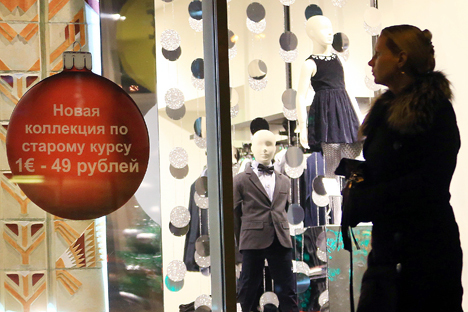 “Usually goods in Russian boutiques are 16-18 percent more expensive than in Europe. But because of the exchange rate, Russian stores have been forced to sell for 30 percent cheaper than the original European price,” a source in sales management at a luxury brand told RIR. To minimize their losses, some brands have decided to offer only their cheapest items to buyers at the old prices. Cartier, for example, stopped selling items worth more than 1 million rubles, according to a source while Hermes refrained from selling its most expensive handbags and items made of exotic leather. Esper Group’s Yedernaya said that regardless of whether or not fixed exchange rates are used, all luxury brands exceeded their sales plans by 120-140 percent in 2014. “Excessive demand began roughly a week before Black Tuesday. Peak demand lasted five days – from Black Tuesday to Saturday. It was followed by a second wave that was less active,” Yadernaya said. She attributed the influx of buyers to the desire to buy products at the old price before the dollar jumped again, as well as to the desire to invest in tangible goods. Many importers developed a program to maintain sales, which entailed fixing the exchange rate on the condition of a certain prepayment. Volkswagen, for example, promised to fix the rate in exchange for a 20 percent advance payment. But the special promotions were cancelled immediately after the ruble plummeted. Usually in Russia, dealers buy cars from the supplier after a contract is signed with the client, which is why the buyer pays for the car at the exchange rate on the day the contract is signed. “Moreover, the majority of car showrooms could not guarantee the price even at a 100 percent prepayment,” the RIR source said. In many cases, dealers inform buyers that the cost of their car has risen after the dollar undergoes another dramatic increase. Some clients agree to pay extra, but others back out of the deal altogether. Some dealers were forced to suspend sales completely. Avialon, a large Moscow-based holding, was the first dealer to freeze sales. Many other dealers, including major importers such as LandRover, BMW, and Audi, as well as the main assembly factories such as Peugeot, Citroen, Volkswagen and Renault, followed suit. According to experts, some dealers have decided to set aside some cars for sale in 2015.